Beyond the desktop: deploy complete workspaces in the cloud. Rapidly deploy applications and desktops and execute frequently performed user administration and support tasks with intuitive single-pane-of-glass, Web administration tools and easy installation of over 1,000 business applications plus popular SaaS applications. Cloud Workspace Suite’s security architecture provides comprehensive auditability. Cloud Workspace Suite has rigid controls, granular user management and customized reporting and audit trails to achieve the strictest compliance levels in a cost-efficient manner. Compliance with PCI, HIPAA, GLB, SARBOX, FINRA, and other data protection standards is simplified by Cloud Workspace Suite. With end-to-end encryption, simplified user and resource security management and design controls, the platform enables administrators to prevent corporate data from leaking to private devices. It also supports and provides client reporting, SPLA license reporting for Microsoft applications and license management for all applications on the platform. Cloud Workspace Suite runs on any public or private cloud infrastructure, and any hypervisor, speeding time-to-deployment by eliminating costly engineering work. The platform is highly scalable and resilient, with multi-tier fault tolerance and load balancing. It’s been architected from the bottom up to be deployed across multiple data centers and multiple IaaS vendors, yet still maintain a single-pane-of-glass management interface. A powerful API set allows for ease of integration with our customers’ existing operations and business support tools, simplifying deployment of the Cloud Workspace Suite platform while speeding time to deployment. The multi-tenancy functionality allows for granular delegation of the platform’s functionality to partners and customers while maintaining visibility and control over all deployments. 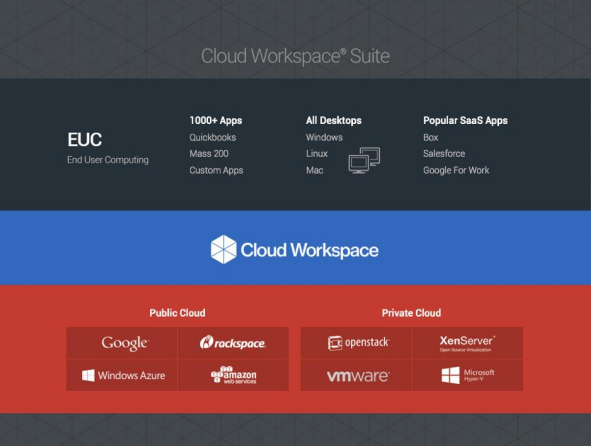 Cloud Workspace Suite was built from a user-first perspective. It provides a best-in-class, single-pane-of-glass control panel to enable the rapid deployment, management and support of the virtual data center infrastructure, Workspace, applications and desktops as a service. With lower levels of technical resources required, Cloud Workspace Suite significantly reduces an organization’s cost structure. Cloud Workspace Suite is offered with a fully developed HTML 5 access portal to leverage modern browsers and extend Windows Desktops and Apps to any device. The Cloud Workspace Suite platform team has currently certified over 1,000 different custom and off-the-shelf applications. It is architected to allow for simple and repeatable integration of additional applications.